← Lynn’s Got a New Car! Lynn’s nephew Lincoln escaped the woods of Maine 12-15 years ago and headed for the mountains of Montana. He’s been there since, and he hooked up with a nice girl from Minnesota who did the same thing. They’re both extreme outdoorsy people, a perfect match. They decided to get married and we got an invitation, so we decided to attend! We hadn’t seen him for years and years so it was about time! Neither Lynn nor I had been to that exact part of the country, but we’ve been close with family and friends in Colorado and Wyoming, so we decided to burn some expiring frequent-flyer miles and fly to the festivities first-class! My FF miles were with USAir, which recently merged with American Airlines. Neither airline flew to Montana per-se, but American did fly to Jackson Hole WY, which is about a 5-hour drive from Livingston MT where the wedding was to be, and that drive is through some boring scenery the likes of places like Yellowstone National Park and Grand Teton National Park, so we decided to take a week, fly into Jackson Hole, drive to Livingston, enjoy the drive, enjoy the scenery, enjoy the wedding, and have some fun! The irony of the trip was not lost at work. Most projects at MITRE have nicknames, and the nickname of the project I was working on at the time was… wait for it… MONTANA! The first leg of our trip, our flight out of Boston to Dallas-Fort Worth, was departing at 2:25 pm EDT, so we had a relatively leisurely morning before the flight. Lynn’s sister Gail traveled with us, so she came down from NH the day before and stayed with us overnight. Lynn was uncharacteristically ready ahead-of-time, all packed the night before, so the morning of the flight was cool, calm, and collected – delightful! We drove to Anderson Regional Transportation Center to park the car and hopped on the 11:00am Logan Express shuttle bus to the airport. We were at the airport and checked in in plenty of time. The plates and screws in Lynn’s ankle had no effect on our TSA screening adventure. This trip gave us a chance to spend some expiring frequent-flyer miles from my business travels over the years, so we flew first class both ways. What a treat!! We took American Airlines Flight 1578 departing Logan Airport (BOS) at 2:25pm EDT, arriving at Dallas-Fort Worth airport (DFW) at 5:37pm CDT (6:37pm EDT). DFW is the third busiest airport in the world when measured by aircraft movement and the ninth busiest when measured by passenger traffic. It has five terminals laid out as semi-circles along a central artery. The inner part of each semi-circle contains parking for cars, an access road, and then the terminal building. This makes for a l-o-n-g distance from one end of the terminal building to the other. Our BOS-DFW flight landed at gate A11, and the connecting flight to Jackson Hole Wyoming Airport (JAC), American Airlines Flight 1456, was initially scheduled to depart from gate A39 at 7:25pm CDT; same terminal, but one hell of a walk for three folks over 60 and one with a surgically-repaired ankle. Luckily we had a 2+ hour layover so we took our time. Just as we got to gate A39 my American Airlines smartphone app informed me that the flight had been changed to gate A23 – halfway back the way we just came, so after a short rest we turned around and schlepped back to A23 – slowly. We landed in Jackson Hole a little after 9pm MST (10pm CDT, 11pm EDT), and saw a spectacular sunset over the Grand Teton Mountains from the plane as we landed. For some reason I didn’t have a hardcopy of the car rental info so I stood in line at a few of the usual suspect rental companies (Hertz, Avis, National) to see if they had me down for a reservation; nope. I had to fire up the laptop to find the name of the company – Dollar Rent-A-Car, one of the three off-airport agencies. The Dollar shuttle bus had already left, so I called them to send another. “Off-airport” was about 10 miles away, in the center of town. We picked up the car, played Trunk-Tetris with the suitcases, and headed out via GPS over the Teton Pass Highway (Rte. 22) in the pitch black to Victor, Idaho and Morley’s Acres Farm and B&B, 30 miles northwest of Jackson Hole. We arrived about 11:30pm MDT (12:30am CDT, 1:30am EDT). Luckily we had called ahead to keep the inn-keeper Julie Morley appraised of our ETA, and she was waiting at the door when we arrived. She got us settled in and then excused herself as the 8am breakfast wouldn’t cook itself! I woke up early at the B&B, tiptoed out of the bedroom and wandered around outside. Sunny and chilly (36ºF) out there! 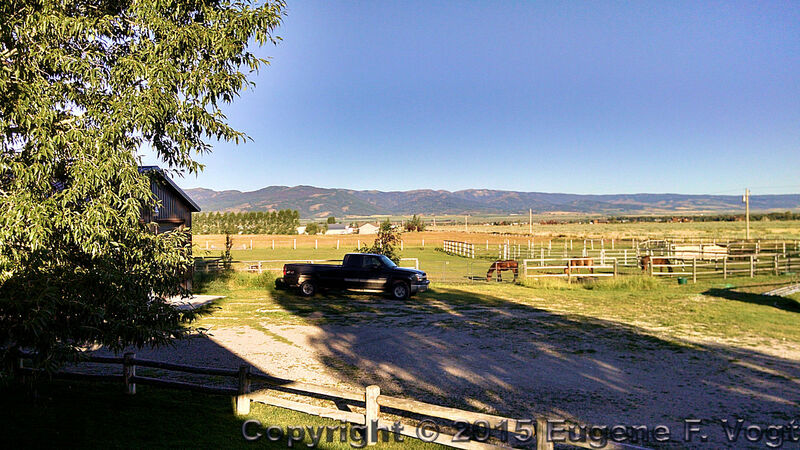 I got my digital SLR out to take some pictures of the horse corrals and mountains, but my 12-year-old stock Canon 18-55mm lens had failed (the thumbnail and accompanying photo to the left was taken with my cell phone). This was the lens that came with my first digital SLR camera, a Canon Digital Rebel purchased back in 2003. When I bought the newer Canon T3i a few years ago, I bought the camera body without the lens, planning on using the original lens with the new body. That worked out pretty well – until today. Every time I pushed the shutter button I got a message on the back screen that said… “Communications between the camera and lens is faulty. Clean the lens contacts.” I cleaned the contacts on the lens AND on the camera – nothing. I popped the 75-300mm telephoto lens on, and it worked flawlessly, so the problem wasn’t with the camera body. I could get the stock lens to work maybe one out of twenty tries. Not good, with a wedding coming up Saturday – and not enough time to get the broken lens fixed. Then I remembered that we were driving to Livingston via Bozeman, a big enough city to have a few camera stores, so I could try to find a replacement camera lens. Hope springs eternal! We drove north with Yellowstone National Park and the Idaho/Wyoming boundary to the east, and the Teton mountain range to the west. We stopped for lunch in West Yellowstone (the town, not the park) at the Geyser Grill on Rte. 20 (the Elk burgers were tasty) and continued north from there. We stopped at Bozeman Camera & Repair to buy a replacement stock lens (a gently-used Canon EF-S18-55mm f/3.5-5.6 IS [IS=Image Stabilization] lens for $65). Great staff, even greater prices! We got to Livingston around 4pm, checked into the Comfort Inn hotel by the highway (Rte. 90, the same numbered interstate throughway as the Mass Turnpike! ), met up with Lynn and Gail’s sister Jan, and headed out for dinner at the Livingston Bar & Grille – nice restaurant with an AWESOME old-style hand-carved bar. An orientation day. We slept late (some later than others), kicked around downtown Livingston, explored a bunch of shops, and had lunch at Pinky’s Café (an interesting and promising menu, but ultimately a bit disappointing in execution). For the afternoon we were off to the wedding venue (Yellowstone Lodge House in the Paradise Valley) for a cookout and to meet the bride. We got re-acquainted with the groom-to-be, met the bride-to-be and her family, soaked up the western ambiance and scenery, watched a spectacular sunset over the Tetons, caught up with folks we hadn’t seen in quite a while, and thoroughly enjoyed the evening. I had quickly put together a draft genealogical chart/scroll, showing the groom’s ancestry back 15 out of a possible 47 generations (theoretically back to 45th Great-Grandfather Bishop Arnulph, who died in 631, on a line that includes Emperor Charlemagne and connects to William the Conqueror, if I had wide-enough paper). It was intended as a taste of the eventual wedding gift, once I get some of the bride’s family information to add to the chart. The draft chart was printed on a plotter, was two feet wide and about 12 feet long. Lazy morning. We abandoned the hotel breakfast offerings (one can only take so much of the “continental breakfast” fare at budget hotels) and hit the well-reviewed but also well-hidden Faye’s Café in the Shane Civic Center on E. Lewis Street for breakfast. Very tasty! We had some fine sandwiches for lunch at Matt’s Old Fashioned Butcher Shop & Deli in Livingston, then headed south on Rte. 89 to explore Paradise Valley along East River Road (Rte. 540) and up to the Pine Creek Campground at about 5600 feet altitude. 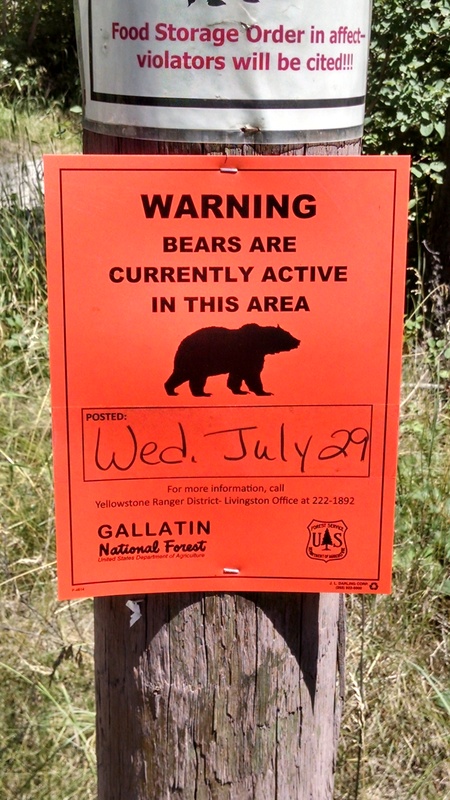 We saw bright orange signs all over the place warning campers and hikers that “…BEARS ARE CURRENTLY ACTIVE IN THIS AREA…” and a warning that the “… Food Storage Order was in affect – violators will be cited.” Grizzlies were about! Our traveling companions defaulted on dinner, preferring to use up previous-meal leftovers in the hotel room, so Lynn and I headed to Copper John’s Bar & Grill in the Best Western Hotel in Livingston for dinner, where the pan-fried trout was supposedly good. We weren’t impressed; it was overcooked, and it looked more like salmon than the trout we’re used to (though the two are related species-wise). Lynn and I spent the morning exploring Bozeman, hunting quilt shops (we found three; The Silver Thimble, which was right beside the camera store we stopped at on Wednesday, though we didn’t see the shop then; Main Street Quilting, right in downtown Bozeman; and Quilting in the Country, on the outskirts of the city). After the first two we ate lunch at an Americanized Thai restaurant called Rice, on Main Street – nice place, good food. Then we went in search of the third shop, which had great photogenic out-buildings on the property so I was entertained as well! 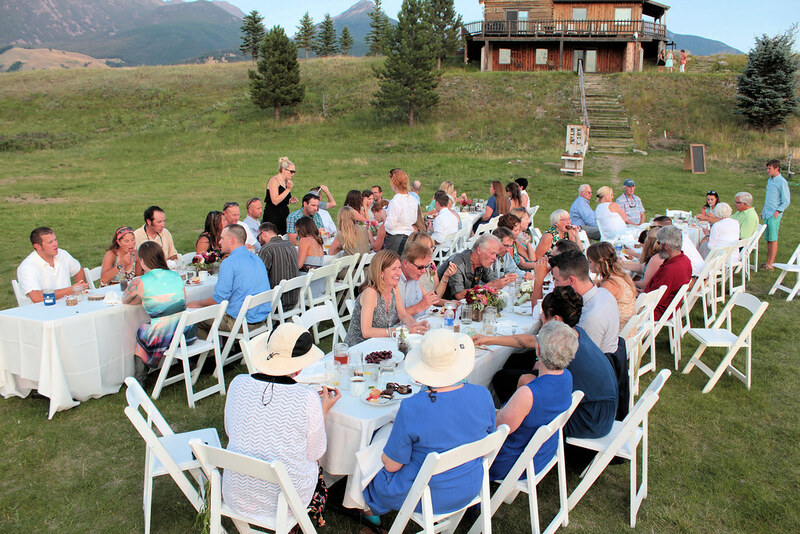 In the afternoon the four of us drove back to the Yellowstone Lodge House south of Livingston in two cars to attend the social event of the summer – the wedding of Lincoln and Stephanie in the afternoon. Hot temperatures (~95⁰F), bright sun, a mostly-cloudless sky, and extremely low (to us Easterners) humidity greeted us on the plain of Paradise Valley at an altitude of about 4800 feet. Three of the eastern sisters (minus the eastern mother-of-the-groom) laid claim to a small patch of shade under a pine tree in the open area where the ceremony would be held, where they were kept hydrated by frequent delivery of ice water and lemonade from the catering tent. 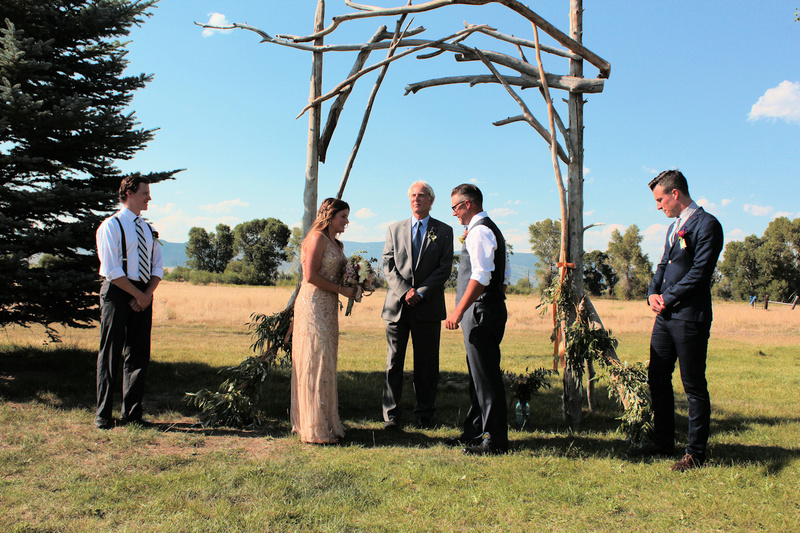 The ceremony was officiated by the uncle of the bride, and was held under an archway made by the groom from driftwood pulled from the sandbars in the Yellowstone River. The eighty-five or so guests then congratulated the newlyweds and hydrated while the caterers completed the dinner preparations. Two long tables were set up in the field with about twenty place settings per side. Tenderloin beef with roasted fingerling potatoes and beet salad was served family-style, while some of the fairer-skinned attendees ate under parasols and umbrellas providing a bit of shade. I took a lot of photos at the wedding and processed them that night to upload to Flickr while I slept (upload speed at the hotel was abysmal) and deliver to the parents of the groom as soon as possible. Having set my laptop computer to uploading the culled- (400+ pictures down to 85) and processed- (exceedingly bright sun creates exceedingly dark shadows, especially on faces) wedding images to my Flickr account for online sharing, I went to bed a little before midnight, but being an older guy I needed to get up a few times during the night. At 2:30am the images were still uploading, but at 4:30am they were done, so I popped off an email to the principals involved with the link to the pictures on Flickr, and went back to bed. The next morning I got up and had breakfast in the hotel, then walked to the Albertson’s Grocery Store across the road to see if they had thumb drives for sale; I wanted to be able to give a full-resolution set of processed images to the parents of the groom. Albertson’s did not have any thumb drives that I could find but the Conoco Service Station on the other side of Albertson’s did so I bought a 2GB thumb drive with a U-Montana “Bobcats” logo and went back to the hotel and uploaded the images to the drive (much faster than the Flickr upload!). We had two more restaurants in Livingston we wanted to try before leaving the area the next day, so we had lunch at the Northern Pacific Beanery in the old train station by the still-functioning train tracks. It was Sunday morning and they had been so swamped with breakfast customers that the kitchen suspended taking lunch orders for about a half hour, but we weren’t in a hurry so we sat at the table and chatted about the wedding and what a great day it had been. The parents of the groom had been visiting other family members at a downtown hotel before their departure, so they swung by the Beanery while we were there waiting. I gave them the thumb drive of photos taken at the wedding, and we made arrangements to swing by the venue after lunch. We drove back down to the wedding venue where both sets of parents were staying to say our goodbyes to the bride’s family and the San Francisco-based best man and brother of the groom. All four sisters and myself and brother-in-law Tom sat around the not-lit fireplace in the main house, recalling the previous day’s ceremony and party and reminiscing about when the groom was a tow-headed toddler. Our dinner was at the Montana Rib & Chop House in Livingston, the last Livingston “gotta try” restaurant on our travels-bucket-list, and it lived up to its reviews except for the noise-level. I had an awesome 28oz. dry-aged-for-45-days bone-in rib-eye steak that I shared among all; possibly the finest steak I’ve had since eating at the now-defunct Ross’ Steak House at the corner of 72nd and Dodge in Omaha NE in the mid-eighties! Drinks at the hand-carved antique Livingston Bar & Grill bar closed off our last full day in Montana. They had a respectable collection of single malts – the expected 12-year Glenlivet, a 12-year doublewood Balvenie and a 10-year Glenmorangie, but also a 10-year Edradour, a 16-year Lagavulin, and one delightful Benriach I had never heard of! Lynn, Gail and I hit the road south to drive back to Jackson Hole, from whence our return flight left, and Jan stayed an extra day to enjoy some peace and quiet before heading home. The first fifty or so miles of the ride rolled down the middle of Paradise Valley and the Yellowstone River on Rte. 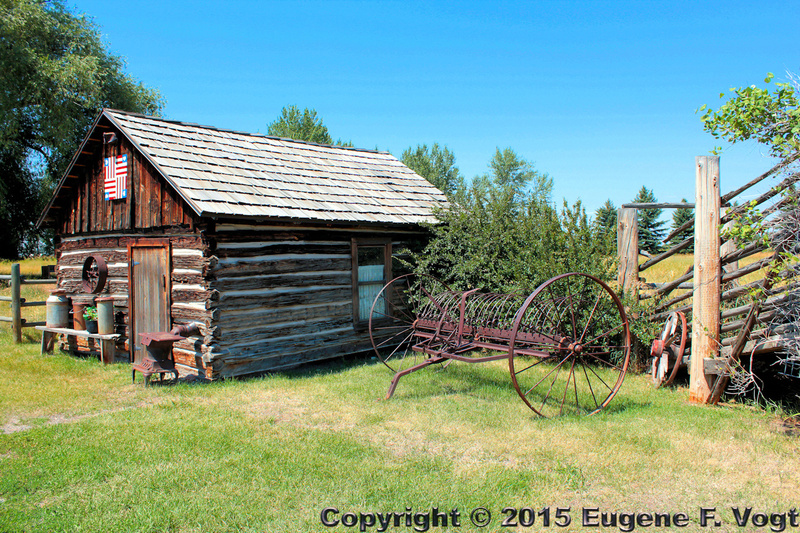 89, a 70mph undivided highway – and a pretty ride. We hit Gardner MT and the north entrance to Yellowstone National Park and a 20-or-so car backup at the gates. Normal entrance fees are $30 per car, but there is an “Inter-agency Senior Pass” option that costs a one-time fee of $10 that we took advantage of. The Inter-agency Senior Pass is a lifetime pass for U.S. citizens or permanent residents age 62 or over. The pass provides access to, and use of Federal recreation sites that charge an Entrance or Standard Amenity Fee. The pass admits the pass holder and passengers in a non-commercial vehicle at per vehicle fee areas and pass holder plus 3 adults at per person fee areas. I was driving so I coughed up $10 and I now have free access to all Federal recreation areas! There are a few benefits to growing old! We continued along Rte. 89 into the park, which changed from a well-built undivided highway capable of sustaining 70mph speed limits to a curvy mountain-pass road with 45mph speed limits, and 35mph speed limits on the more curvy parts. We had heard occasional horror stories about massive traffic jams in the park when a bison or an elk appeared and all the tourists stopped in the road to gawk, so we were a bit worried about being able to make the whole drive to Jackson Hole in one day, but our fears were unfounded. We drove through Gardner Canyon beside the Gardner River, silently crossing the Montana-Wyoming state line by the Boiling River turnout, where the hot water from the various geothermal features in the area causes the river to steam even on hot days. 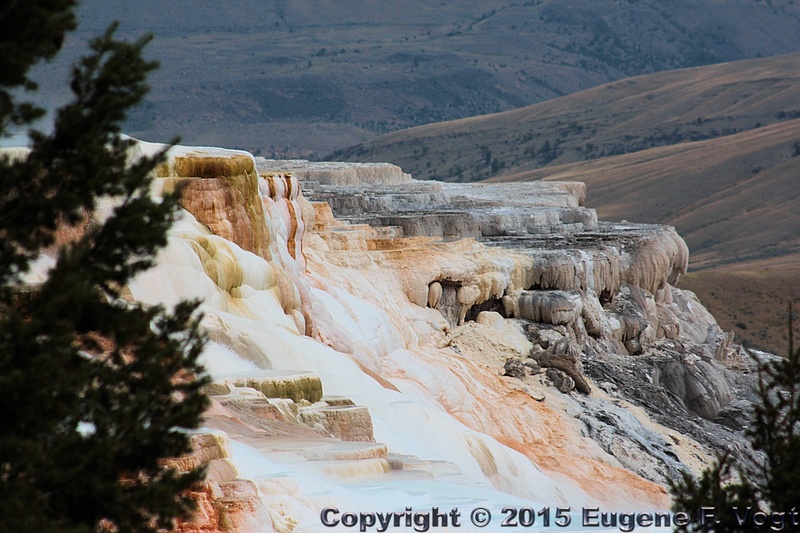 Our first pullover stop was after the Mammoth Hot Springs complex to view the Lower Terrace Area of the Hot Springs. The “white rocks” are deposits of calcium carbonate that have dissolved from the hot water running over underground limestone and were deposited on the cooler surface rocks topside. We next stopped at Beryl Spring, which was a touristy pull off by the side of the road with a real parking lot and boardwalks to the spring. 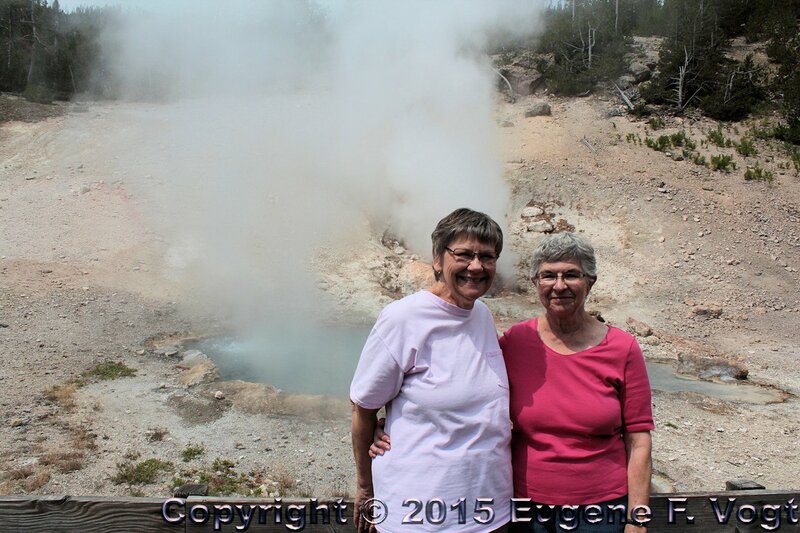 There was a hot spring (bubbling hot water) and a fumarole (belching steam and Sulphur Dioxide) in a single location – one picture frame got them both! Soon after that we stopped at the Fountain Paint Pot Nature Trail, which was a half mile walking tour over boardwalks to see hot springs (the Celestine Pool), the bacteria beds (cyanobacteria, which can live in waters as hot as 167⁰ F), the Fountain Paint Pot (hot bubbling clay mud), the Red Spouter (a rumbling fumarole this time of year), a field of geysers (Clepsydra, Fountain, Twig, etc. ), and the abundant lodgepole pines that drowned in hot acidic water when nearby hot springs shifted their flow. 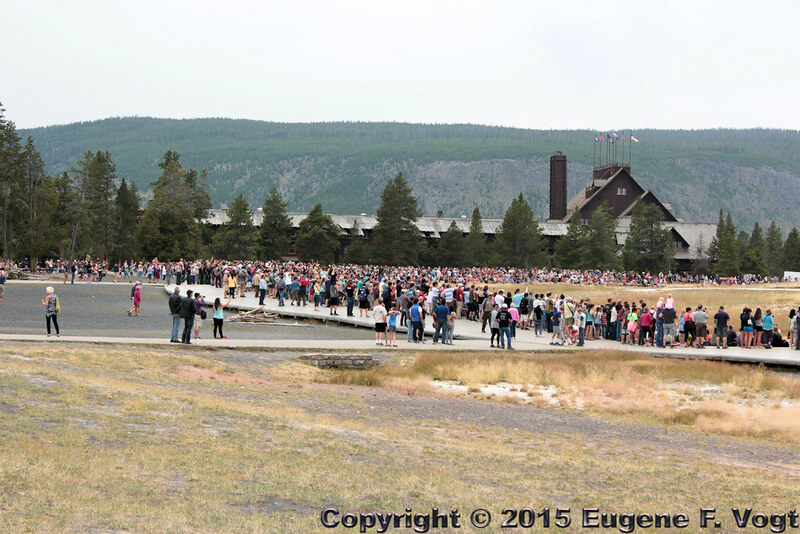 Our next stop allowed me to cross an item off my personal bucket list – Old Faithful. It was getting a bit late for lunch (~2pm) and we were hungry (and there aren’t many choices for food in the park) so we took the short detour off the Grand Loop Road into the enormous Old Faithful complex. The huge parking lot was teeming with cars and busses, so I drove up to the lodge (where the cafeteria is) and dropped the girls off while I took off to find a parking space. Lady luck was on my side as I immediately found a spot just a single row out from the lodge. I caught up with the girls in the cafeteria and we enjoyed BLT roll-ups (with huge amounts of chewy bacon jerky!) and salads. After eating I scooted out to see if I could find out when the next eruption was scheduled, and it was for “about” 3:28pm, less than a half hour away! 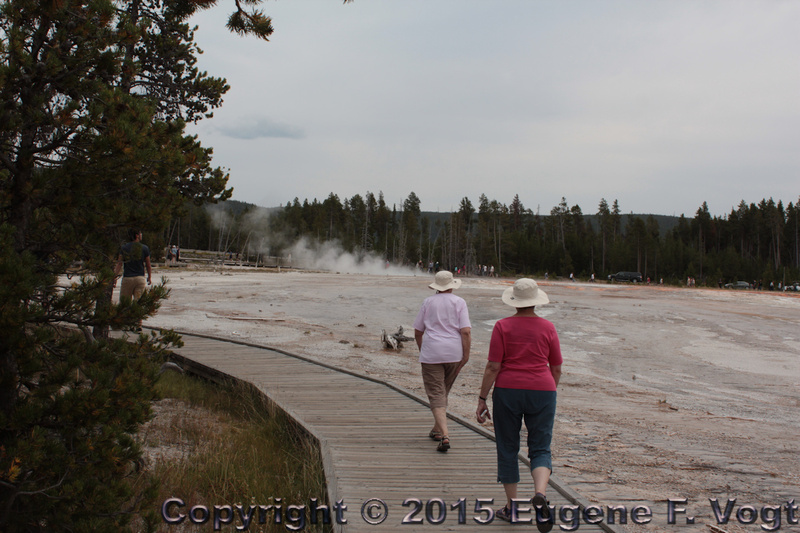 Crowds had been gathering in the amphitheater around the steaming geyser while we were eating (the cafeteria had a ringside view) so I headed out with my camera and gear while Lynn and Gail found seats overlooking the show on the lodge veranda – in the shade! As the crowd swelled into the thousands, I wandered around behind the hordes scoping out the view, but decided the veranda had the best easily-accessible view so I moseyed back to the lodge and joined the girls. 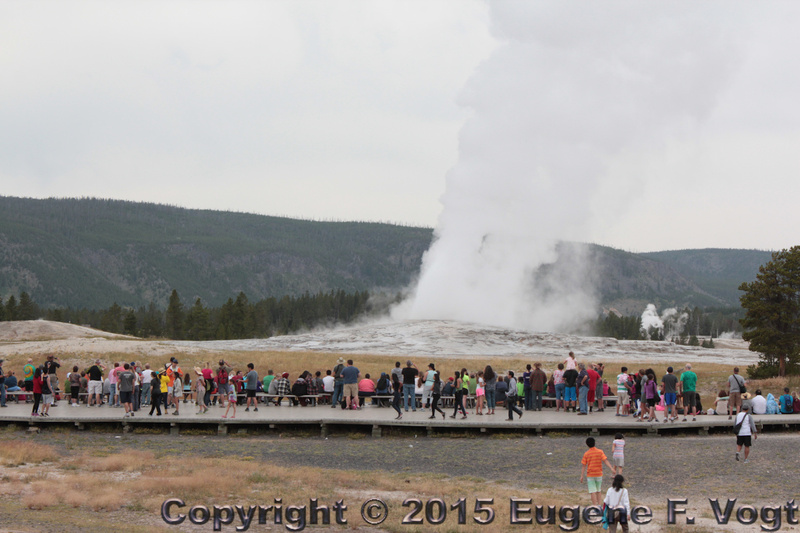 An Old Faithful eruption lasts 1.5 to 5 minutes and reaches a height of 90-184 feet (27-55 m). I had thought the period of time between Old Faithful’s eruptions was fairly precise, but in reality it ranges from 35 to 120 minutes, though the average is 92 minutes. About 90 percent of eruption predictions are accurate within a window of plus or minus 10 minutes. That schedule that said “about” 3:28pm was my clue that the eruptions were not precise. 3:28pm came and went, then 3:30, and 3:35. Closer to 3:40 (over ten minutes LATE!!) she finally blew. The crowd was getting antsy, so there was a loud cheer when she finally let loose. The traffic jam we got stuck in after the eruption was predictable and expected with thousands of people waiting for and watching a ten-minute event, but we needed gasoline for the rental car and there were TWO gas stations at the Old Faithful complex, so we let the traffic dissipate as we filled the tank. Back on the road, we drove by West Thumb Lake and along the shores of Lewis Lake and Jackson Lake, exiting the park out the south gate and directly into Grand Teton National Park. We followed the Snake River Valley along Rte. 89, stopped once more to get some panoramic views of the Grand Teton range across the valley, and rolled into Jackson Hole to find our hotel for the night around 4:30pm. Purely by coincidence but delightfully convenient, our hotel (the Jackson Hole Lodge) was on West Broadway / Rte. 89, diagonally across the street from the Dollar Rent-A-Car drop off lot that we had to be at by 4:45am the next morning. We walked West Broadway for a few blocks looking for a place to eat dinner, but all we found were pizza places or nouveau tapas bars, all very crowded and noisy, so we punted and had dinner at the Silver Dollar Grill at the Wort Hotel, an up-scale elegant place with impeccable service and delicious meals (slow-roasted Bison spare ribs on a bed of grits as an example). We strolled back to the hotel and hit the hay, with an alarm-clock-assisted wake-up at 4:00am so we could pack the car (more Trunk-Tetris) and drive across the street to unpack the car and hop the 5:00am shuttle to the airport. The alarm clock worked. We were up at 4am, caught the 5am shuttle to the airport, caught American Airlines Flight 115 at 7:00am MDT (9:00am EDT), arriving in Dallas/Fort Worth about 10:45am CDT. We landed at terminal C, but I had pre-booked a people-mover cart to bring us to Terminal A, gate A13, for flight 1094 to Boston, departing at 11:55am CDT. An hour and ten minutes was nowhere near enough time to hoof it from terminal C to terminal A at our age, so the people-mover cart was a requirement. We were delayed 40 minutes landing at Logan by violent thunderstorms in the area with 2-inch hail southwest of Boston. While circling we saw a complete end-to-end double rainbow over the city! Off the plane in Terminal B, down to baggage claim to claim our bags, out to the curb to wait for the Woburn Logan Express bus back to Anderson Regional Transportation Center, get the car out of hock ($56, $7 per day for 8 days), load the car (easier with the SRX than the rental sedan, Trunk-Tetris not needed), and drive home. A tiring but delightful trip. We’ll wait a few weeks before we do it again! Excellent report. Thanks for taking the time to do this. Great to hear what happened after you left, and I stayed behind – Thanks for writing this up!